Automation and robotics are rapidly gaining ground in metalworking - and sawing technology is no exception. Robot-assisted systems are taking over more and more work steps following the sawing process, make production more flexible and efficient. In recent years, the demands have increased on metal processing in every industry, including the steel trade, automotive manufacturing and machine engineering. Customers want greater manufacturing flexibility, from batch sizes of one item to large-volume production. The variety of materials and sizes is steadily increasing. At the same time quality standards are rising, and there is continuous pressure to cut costs. To hold their own against international competitors, companies need versatile and efficient solutions for a wide variety of production tasks. Sawing technology plays a key role in metal processing and offers many opportunities for optimisation. More and more operators of sawing systems are intelligently linking their work processes and automating them with robot support. The benefits are obvious: Industrial robots are fast, reliable and precise, and if necessary they can work 24 hours a day without human intervention. They don’t get tired or fall ill, and they can handle a wide range of tasks when equipped with the necessary tools. 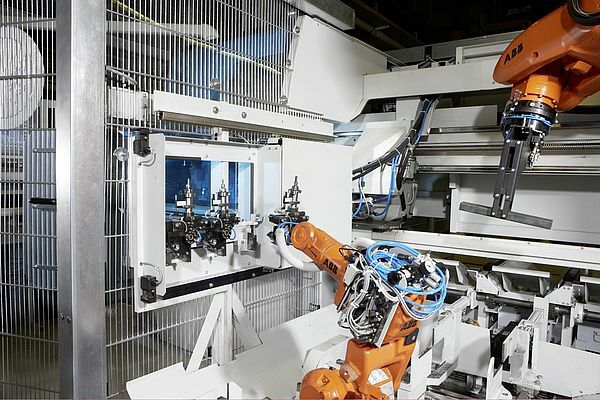 “Our robots help us with a number of handling and conveying tasks and efficiently perform many machining steps,” says Volker Bühler, group manager for robotics at the sawing and storage technology specialist KASTO. Automation starts right with material feeding. The material to be cut is conveyed to the machine by means of suitable equipment, for example roller conveyors or magazines, thus sparing workers the effort of lifting and carrying, and reducing the risk of injuries. Depending on how it is equipped, the sawing machine itself can also run attended. Material is fed to it automatically, and an intelligent machine control system sets all parameters, such as cutting length and cutting speed, based on the job data. State-of-the-art production saws can thus carry out a variety of jobs in sequence, with different materials and diameters, and operate autonomously for long periods. Industrial robots also have considerable potential when it comes to handling and processing finished cut parts. For example, they can remove them from the machine, thus relieving workers of this repetitive task. When equipped with appropriate tools, robots can also perform tasks like deburring, chamfering, marking, centring or measuring workpieces. Cut parts can be weighed, sorted by size or job, and stacked on pallets or placed in containers. The parts can also be transferred directly to a driverless transport system. 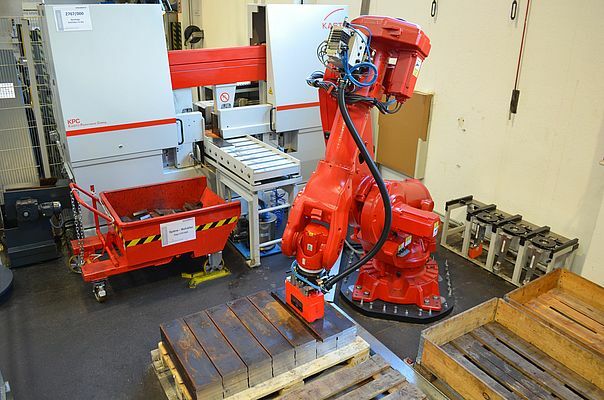 “For complex processes involving various work steps, we also use combinations of different robots and clamping devices,” explains KASTO expert Volker Bühler. 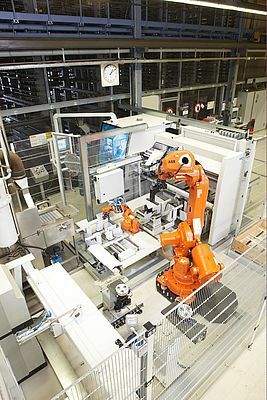 When large quantities of material are sawed with only a few different component geometries, it is relatively easy to automate the downstream processes. The situation is different with custom sawing involving diverse materials and dimensions. “The greater the variety, the harder it is to cover all the possibilities,” says Volker Bühler. The choice of robot tools is an important factor. A robot must be able to deal with all the objects it encounters while using as few aids as possible. This reduces procurement costs, minimises idle times and increases productivity. Users have a choice of mechanical, magnetic or vacuumoperated grippers. The grippers should be as compact as possible to give the robot easy access to the cut parts. Robot technology also helps to improve working conditions. It relieves employees of heavy, tiring and monotonous tasks. The risk of accidents and injuries is reduced. Moreover, the cut parts are of better quality, because robots machine them with equal precision, sort them reliably and stack them neatly. This provides benefits not only for operators of automatic sawing facilities, but also for their customers.